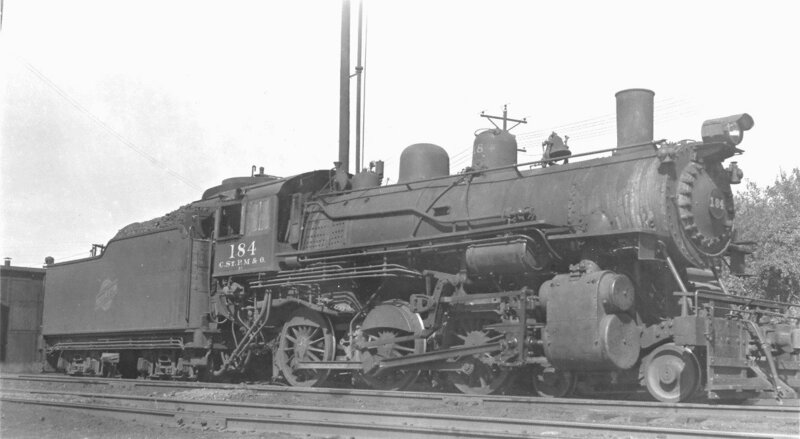 CStPM&O # 15, a six-coupled Switch Engine at Hudson, Wisconsin in 1955. 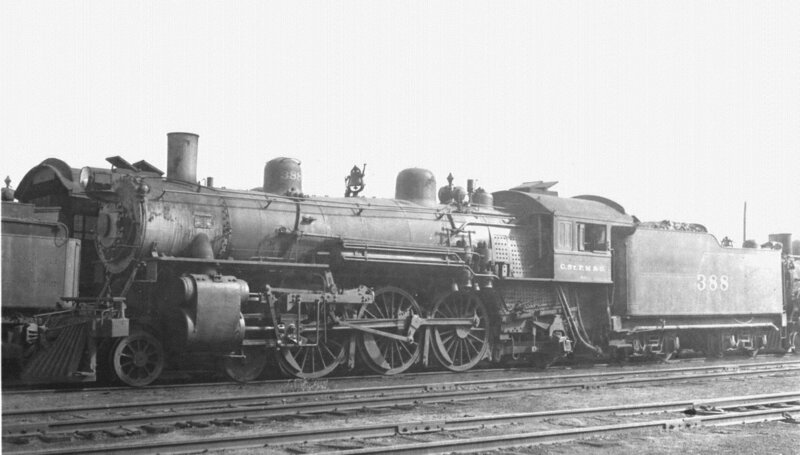 Mr. Stan Mailer says, in his book The Omaha Road, this number is one of class F-6, a 19-inch Schenectady unit with Serial number 5832, built 6/1901 and retired 9/1945. I can't account for the discrepancy other than to speculate that this was an error of notation by the photographer. 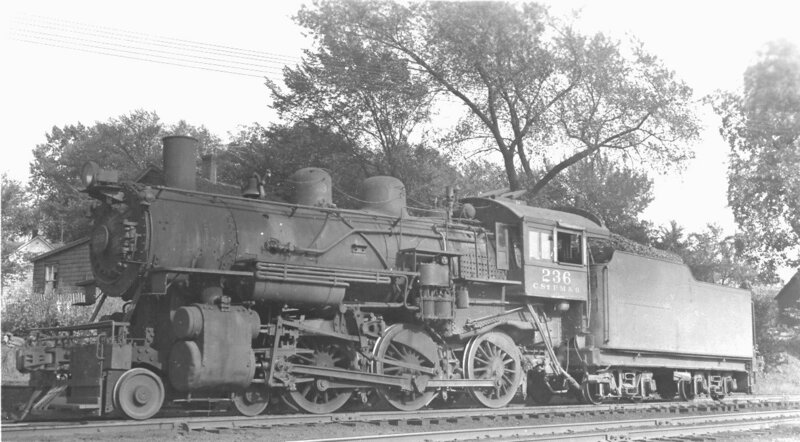 CStPM&O # 81, a six-coupled Switch Engine (Class M-3, built by Alco in 1919) at Itasca, Wisconsin in 1953. Mr. Mailer adds that this engine was built in Alco's Schenectady works, carried Serial number 61339, was built 7/1919 and retired 6/1956. 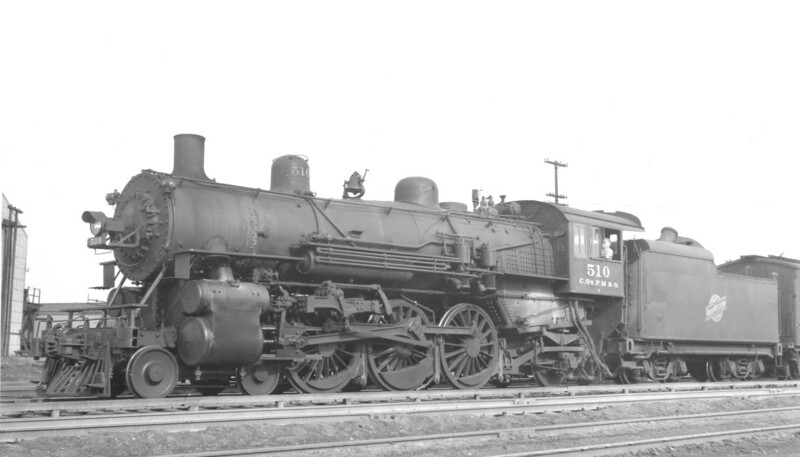 CStPM&O # 102, a "Ten Wheeler" (4-6-0) locomotive at Hudson, Wisconsin in 1955. 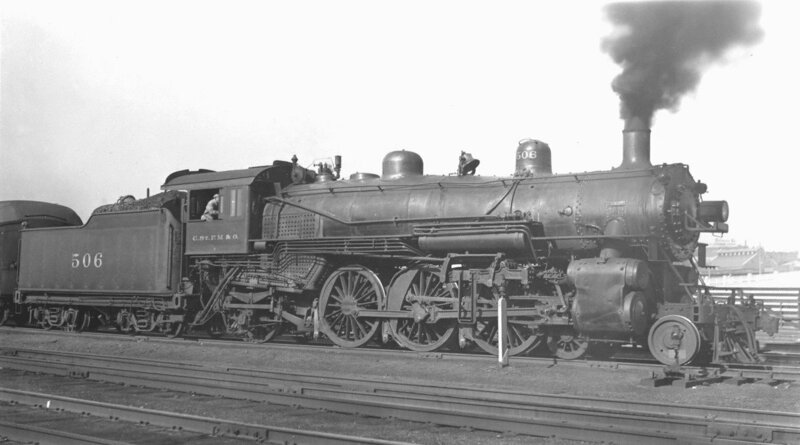 Mr. Mailer adds that this engine was a member of Class I-1, was built in Alco's Schenectady works, carried Serial number 48949, was built 12/1910 and retired 6/1956. 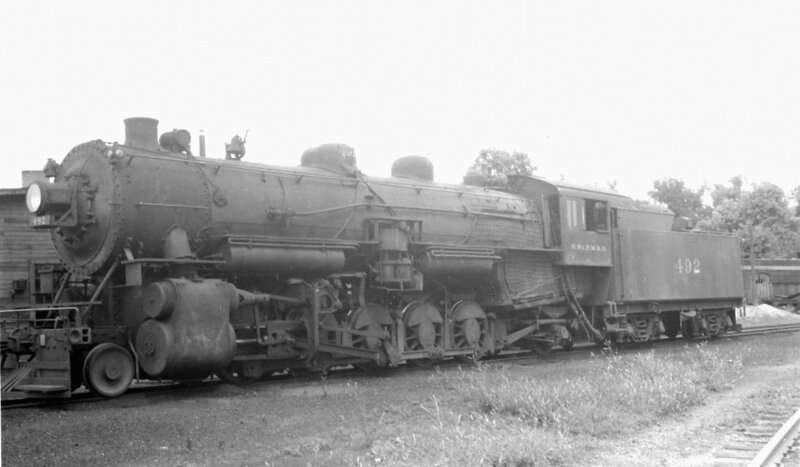 A second shot of # 102 at Hudson, Wisconsin, in July of 1955. 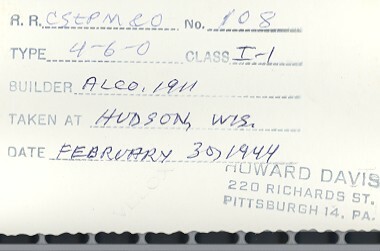 CStPM&O # 108, a "Ten Wheeler" locomotive of Class I-1 at Hudson, Wisconsin on February 30, 1944. 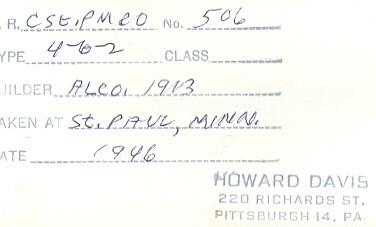 Mr. Mailer's Locomotive Roster says that this engine was a member of Class K-1, was built in Alco's Schenectady works emerging with Serial number 50127, was built 7/1911 and retired 6/1956. 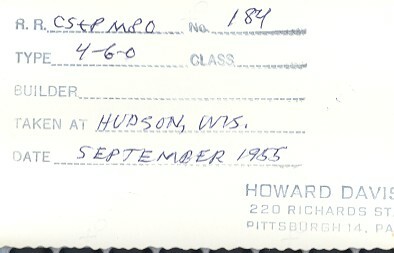 CStPM&O # 184, a "Ten Wheeler" locomotive of Class K-1 at Hudson, Wisconsin in September of 1955. Mr. Mailer adds that this engine was built in Alco's Schenectady works, carried Serial number 52624, was built 2/1913 and retired 6/1956. 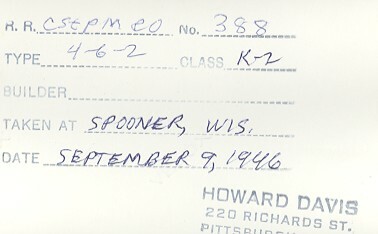 See Specifications for Class K-1 above. 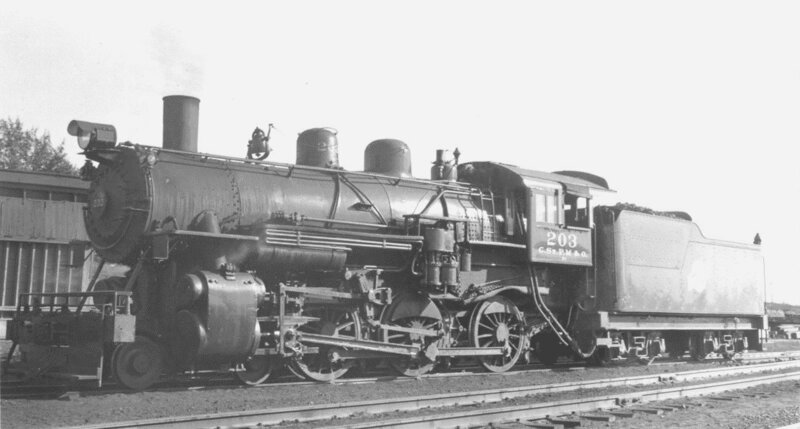 CStPM&O # 203, a "Ten Wheeler" locomotive of Class K-1 (Alco - 1913) at Spooner, Wisconsin on September 3, 1955. Mr. Mailer adds that this engine was built in Alco's Schenectady works, carried Serial number 52626, was built 2/1913 and retired 12/1956. 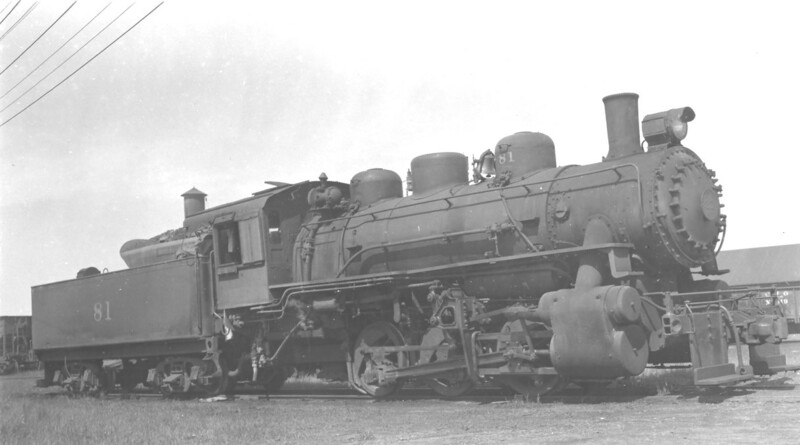 CStPM&O # 218, a "Ten Wheeler" locomotive (Alco - 1913) of Class K-1 at Itasca, Wisconsin in July of 1955. 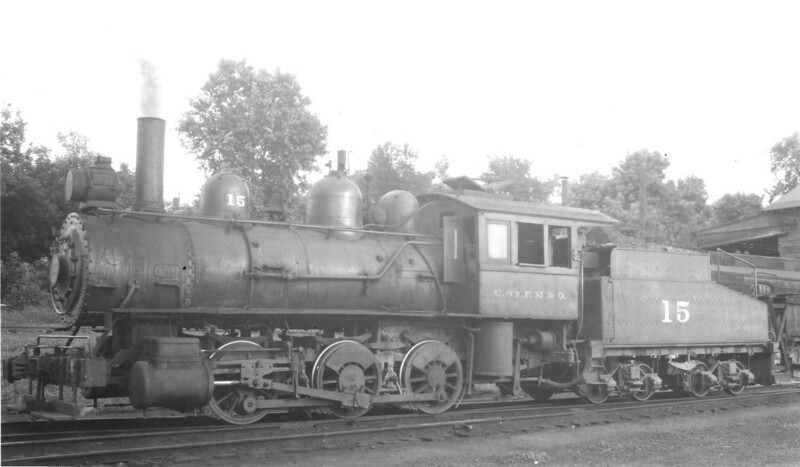 CStPM&O # 219, a "Ten Wheeler" locomotive at Itasca, Wisconsin in September of 1952. CStPM&O # 236, a "Ten Wheeler" locomotive (Alco - 1912) at Hudson, Wisconsin in September of 1955. Mr. Mailer adds that this engine was built in Alco's Brooks works, carried Serial number 50948, was built 4/1912 and retired 6/1956. CStPM&O # 245, a "Ten Wheeler" locomotive (Alco - 1912) at Hudson, Wisconsin in September of 1955. Mr. Mailer adds that this engine was built in Alco's Brooks works, carried Serial number 50955, was built 4/1912 and retired 6/1956. 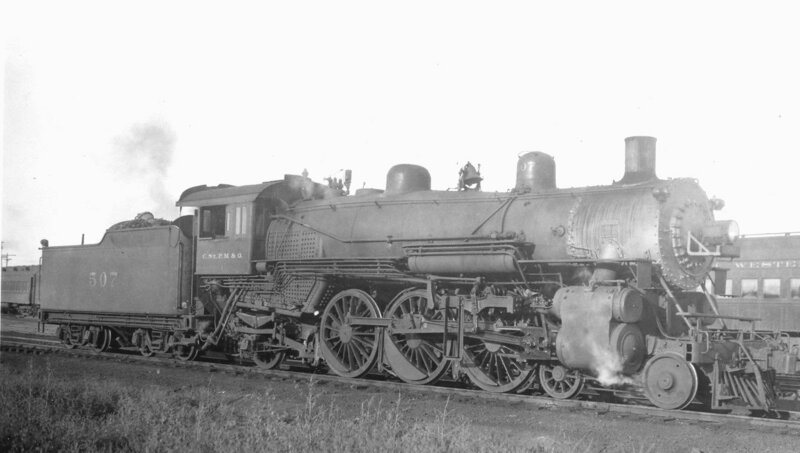 CStPM&O # 388, a "Pacific" (4-6-2) locomotive of Class K-2 at Spooner, Wisconsin on September 9, 1946. 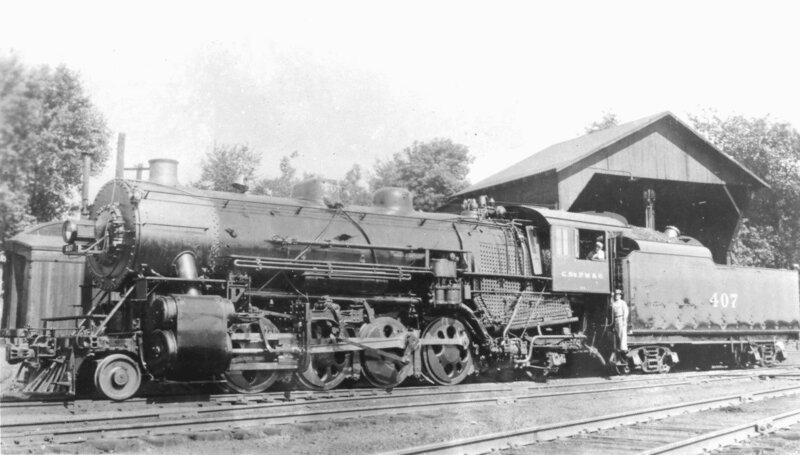 Mr. Mailer adds that this engine was a member of Class J, was built in Alco's Schenectady works, carried Serial number 50124 and was built 7/1911. 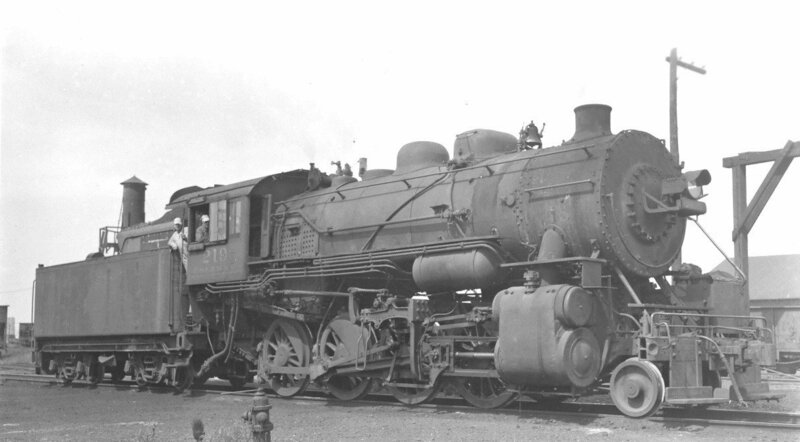 CStPM&O # 407, a "Mikado" (2-8-2) locomotive (Alco 1916) at Spooner, Wisconsin in 1939. 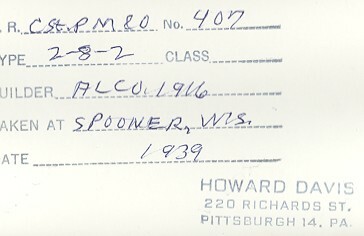 Mr. Mailer adds that this engine was built in Alco's Schenectady works, carried Serial number 55563 and was built 3/1916. 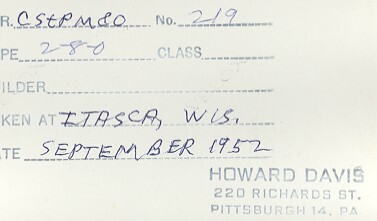 He further states she went to J-A 11/1938 and was retired 6/1956. 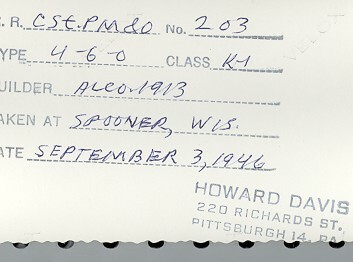 Bob Guhr adds: "The 407 appears to have been taken at Hudson, and not Spooner. 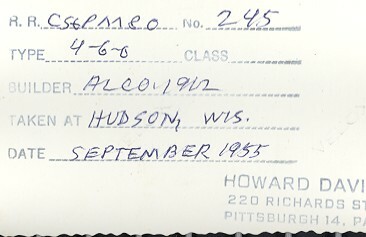 The structure in the background is common to many photos taken at Hudson." CStPM&O # 431, a "Mikado" locomotive (Alco - 1921) at Elroy, Wisconsin in October of 1955. Mr. Mailer adds that this engine was built in Alco's Richmond works, carried Serial number 62614, was built 1/1921 and was retired 6/1956. 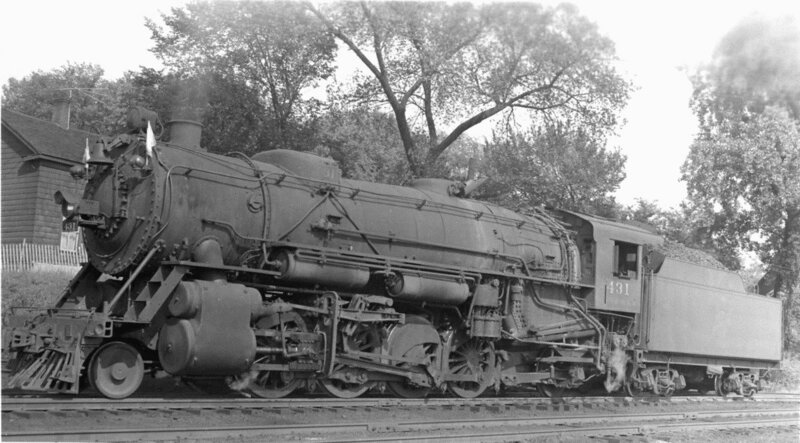 CStPM&O # 492, a "Santa Fe" (2-10-2) locomotive at Spooner, Wisconsin in September of 1946. 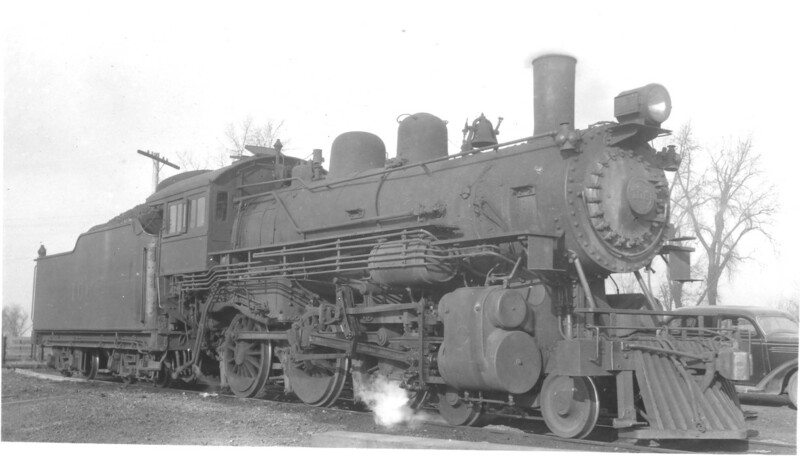 Mr. Mailer adds that this engine was built by Baldwin Locomotive Works, one of Class J-1. She carried Serial number 45977, and was built 7/1917. 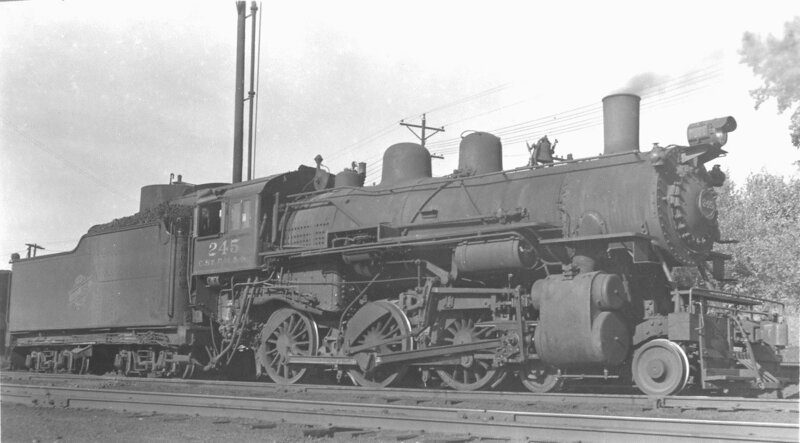 Traded to C&NW in 1944, she was later rebuilt to an 0-10-2 configuration for use as a hump engine. 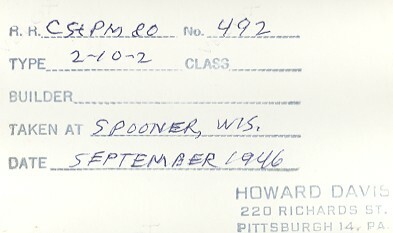 Bob Guhr adds: "The 492 was photographed at Hudson and not Spooner. The date is incorrect because at that time, these engines had been traded to the C&NW for a couple of J engines. 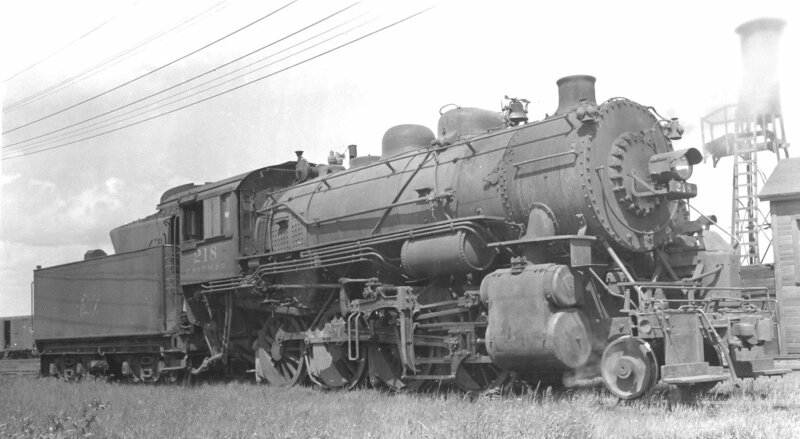 The C&NW rebuilt them to 0-10-2's because the pilot wheels kept derailing on the Proviso hump." 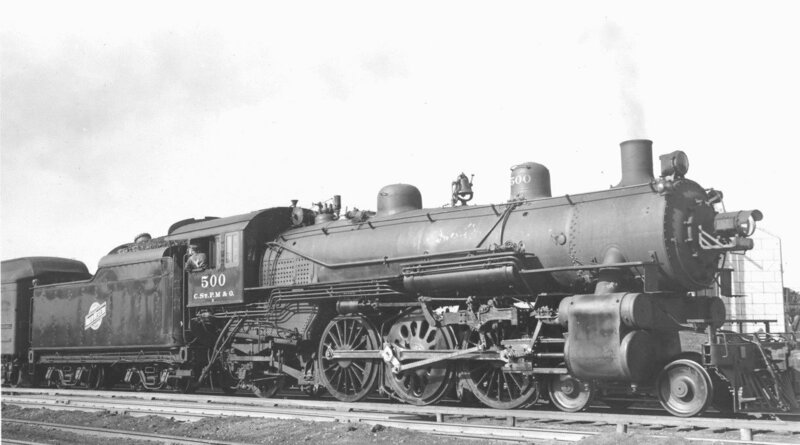 CStPM&O # 500, a Class E "Pacific" (4-6-2) locomotive at St. Paul, Minnesota on May 30, 1947. Mr. Mailer adds that this engine was built in Alco's Schenectady works, carried Serial number 53039, was built 5/1913 and was retired 6/1953. 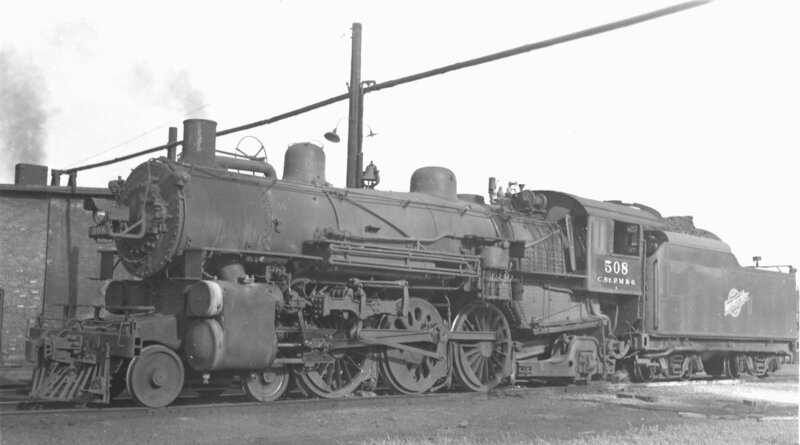 CStPM&O # 506, a "Pacific" locomotive at St. Paul, Minnesota in 1946. 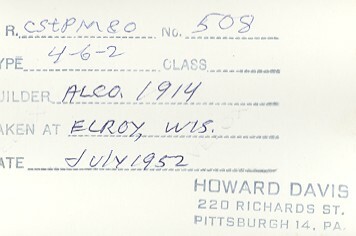 Mr. Mailer adds that this engine was built in Alco's Schenectady works to Class E specs, carried Serial number 53045, was built 5/1913 and was retired 6/1956. 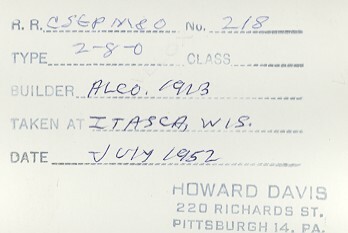 See Specifications for Class E above. 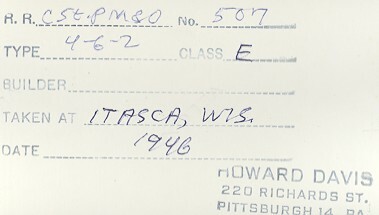 CStPM&O # 507, a Class E "Pacific" locomotive at Itasca, Wisconsin in 1946. 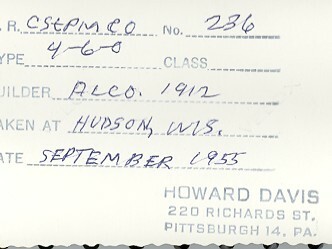 Mr. Mailer adds that this engine was built in Alco's Schenectady works, carried Serial number 53046, was built 5/1913 and was retired in 1952. CStPM&O # 508, a "Pacific" locomotive (Alco - 1914) at Elroy, Wisconsin in July of 1952. 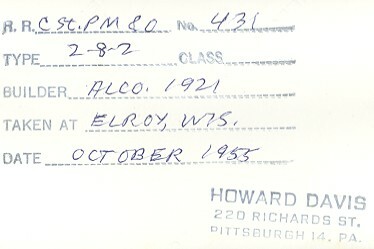 Mr. Mailer adds that this engine was built in Alco's Schenectady works to Class E specs, carried Serial number 53045, was built 4/1914 and was retired 5/1954. 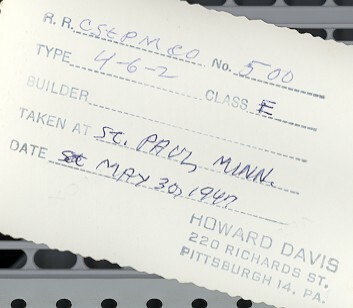 See Specifications for Class E above. 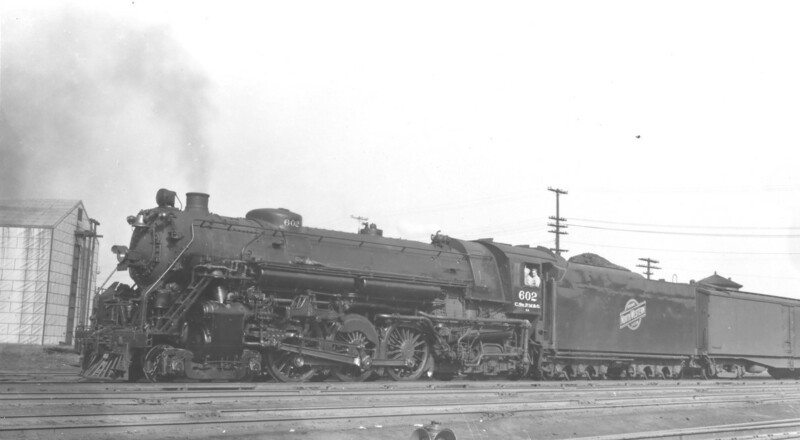 This locomotive (along with # 509) was rebuilt to Class Ea with booster, which provided 46,000 lbs. of Tractive Effort. 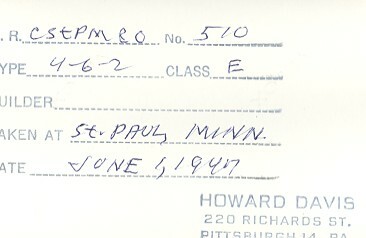 CStPM&O # 510, a Class E "Pacific" locomotive at St. Paul, Minnesota on June 1, 1947. 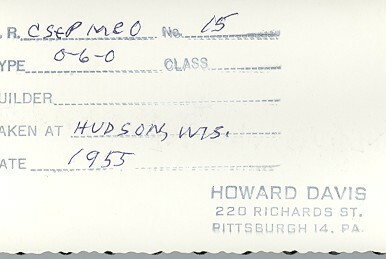 Mr. Mailer adds that this engine was built in Alco's Schenectady works, carried Serial number 54518, was built 4/1914 and was retired in 1949. 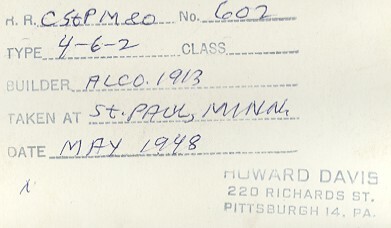 CStPM&O # 602, a "Pacific" locomotive at St. Paul, Minnesota in May of 1948. 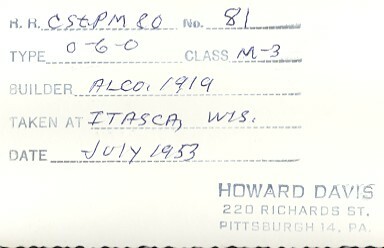 Mr. Mailer adds that this engine was built in Alco's Schenectady works to E-3 specs, carried Serial number 68618, was built 11/1930 and was retired 6/1956. Tractive Effort with Booster: 64,600 lbs. The pictures on this web page were downloaded from Usenet News, where they had been posted by Bud Laws.